Bazooka's Barracks is the home of Bazooka in Donkey Kong Country 3: Dixie Kong's Double Trouble!. It is located on the west side of Mekanos. It is notable for housing Bazooka's cannon, "Big Bessie". In the Game Boy Advance version of the game, Bazooka's Barracks is referred to as Brigadier Bazooka Bear. When Dixie Kong and Kiddy Kong first venture through Mekanos, Bazooka will be unable to help them, for he does not have any ammunition for Big Bessie. However, should the Kongs visit Bazooka once they obtain the Bowling Ball from Blue's Beach Hut, they can use it as ammunition for the cannon, and allow Bazooka to blast them to Sky-High Secret. 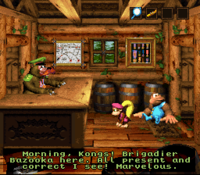 In the Game Boy Advance version, Brigadier Bazooka Bear appears to be a bunker, rather than a cabin like in the Super Nintendo version. This page was last edited on June 6, 2018, at 14:00.